The lumber rack is the unsung hero of the woodworking shop. Its responsible for holding our raw materials safely, securely, and in an organized fashion until we’re ready to use them. Let’s face it: we are all wood hoarders when it comes down to it and most of us over-buy lumber intentionally. So if you plan on amassing anything that can be called a wood “collection” you need a sturdy place to store it all. 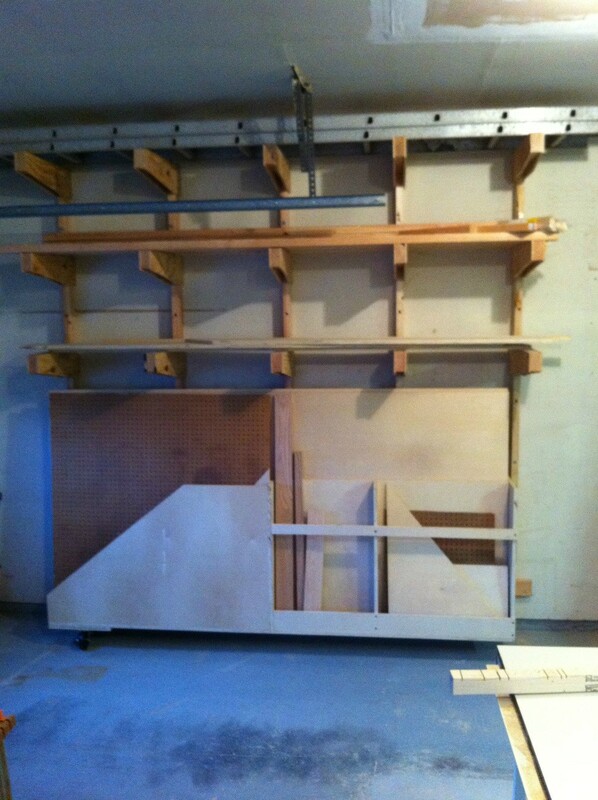 This lumber rack is made entire from 2×4 lumber and 3/4″ shop grade plywood. The uprights are bolted to the wall studs and the bracket supports are screwed to the vertical uprights. The sheetgoods and cut-off storage is tucked away underneath the lumber rack and swings out on casters for easy loading. In fact, I have mine positioned right by the front door so all I need to do is back up my truck and slide the sheets right in. The design is very adaptable and can be customized to fit your personal preferences and shop needs. The inspiration for this project came from two folks: my buddy Aaron Marshall and Chet from the forum. Oddly enough, when researching for this build, the most useful and promising information came from our own forum. Gotta love when that happens! If you decide to build this rack or some variation of it, send me some pictures or post them in the Wood Talk Online Forum! Great video…I just knew you were going to make the “stud” joke..and I would have been disappointed if you hadn’t. :-) Really like the sheet good/scrap cart. You made the cart look so easy. I wonder if adding locking casters would help to stop the cart from rolling out, or did you find that it stayed in place better once the cart had wood in it to weigh it down. Great video and thanks so much for sharing it with us. Well done. JUst a quick question, Why did you build the wood ‘shelf’supports and not just buy metal ones? I am about to build a rack in my new/old shop and I was thinking about just using the $2.00 shelf brackets. Primarily because I wanted an “all wood” solution. And also, any heavy duty shelf supports with 18″ capacity that I have see were well over $2. I got super lucky and got the heavy duty steel stuff on closeout from one of the big box stores… I am going to copy that sheet goods rack though. I desperately need to solve that storage problem! I wish I had some real numbers for you but I don’t. I have seen others apply this design to their shops and stack way more wood on there than I ever have. So it can take what most of us would be able to dish out. But as for specifics, I really don’t know. You should use those small wheels wich have foot brake, so it will not run away all the time. Thanks for the inspiration! One of these will be going in up in my shop very soon. As a fellow science nerd you may appreciate this–I got tired of trying to find the right combination of scraps and such to prop items up (as you did for the sheet goods rack) so I bought a couple used 6″ square, 12″ rise lab jacks and find them to be tremendously useful around the shop. After leveling and installing an item I can crank them down if they got wedged in a little too tight. Set on top of a 4′ step ladder they are great for setting an upper cabinet, I use them as side supports for very long items at the chop saw or the benchtop drill press, and they are nice for aligning long pieces while attaching one end (again, like your assembly of the sheet goods cart). Thanks Mark. I’m actually in the process of dismantling my current lumber storage sled on which I store lumber as well as sheet goods. Pushing it around feels like an event at a world’s strongest man competition. Your ideas have really helped with my reorganization. Is it wrong to get this excited about a wood Rack? Cause if it is I dont wanna Be RIGHT! Beautiful design Marc. Love the shop projects! These generally become the most helpful episodes cause of the little tips and ideas that get used every day! I don’t need a lumber rack but the plywood cart idea is amazing! Great design Marc. Thanks for the video. Nice Rack, Marc! ;-) Missed that one, eh? I’ve been looking at lumber storage for a long time. Unfortunately, I don’t have any studded walls yet. So, I’ll be picking up more than a few 2bys when I get there. Thanks for the video. I always pick a little something up in them. How difficult will it be to get boards on and off the higher shelves? I ask because I have a high shelf with so much stuff in front, it becomes a major hassle to get to the wood. You look like yours will be clean, but I still have an issue with storing 12′ x 8″ oak on a high shelf. Figuring out how to hoard wood and have room to move is a constant battle in my shop. Of course, the larger the board the trickier and more dangerous its going to be. So its probably a good idea to put the largest boards near the bottom and keep the lighter stuff up top. Don’t know of a better solution than that…. And why is it that when you have four boards on a shelf, you need the bottom one! Haha. You figure that one out and you’ll be rich! garage floors are poured with a slight grade, usually 1/4 inch per foot or so. I wonder if that’s causing any of the rolling issues. Almost looks like you need some washers on those caster’s screws. haha, well you guys can come over and help me lift it and we’ll add those washers together! Thanks for the great video! If you were to do it over again would you just go with the lag bolts you decided to add? good question. Maybe. I would probably use the Spax screws for simplicity and then reinforce again with more lags. But there’s no reason you can’t just go with lags the whole way. Good tip on the “shop” ply. I was very glad when I discovered it at my hardwood dealer; it’s great for things like this. Nice design on the sheet goods cart. One thing I’d change, for situations where’s it’s feasible, would be to run the vertical members to the floor, or provide some support between them and the floor. That way, vertical loads are carried directly to the floor, rather than it all being carried by the screws in shear. It seems like here the foundation may get in the way, though(?) No biggie, just and incremental change. No doubt the floor is a good way to go. There are a few reasons I didn’t go that route. First, I wanted as much height as I could get using that particular length of 2×4. Starting 16″ up from the floor helps me take advantage of the extra headroom. Second, the floor slopes a little and I really wanted all my vertical supports to be even with one another. Obviously a few shims would solve that problem. So as a compromise, the horizontal cleat serves the same purpose as the floor. Each one of the vertical supports is sharing the load with the cleat, which is attached to every stud along the length of the rack. Its also nice and level so each stud can simply be dropped onto the cleat and screwed into place. So its not quite as strong as having the floor acting as a support, but probably strong enough for my purposes. Ah, yes. Those concrete subs are limited it how level they get things sometimes. ;) With those lag screws, though, things should be just fine. Probably not a problem in AZ, but in PA I’d be worried about the end grain wicking moisture up from the concrete floor. Needs a WW logo underneath the pull handle. Otherwise nice Rack! Why not have longer 2×4 vertical members, that sit on the concrete shop foundation, allowing the fasteners to only be loaded in tension, rather that installing a ledger, and then the screws and lags have to handle bending loads too? I couldn’t find them in the longer lengths unfortunately. I noticed an tool advantage that readers might appreciate. My impact driver is Makita, and the LED fades out a few seconds after the driver quits. That would eliminate the “strobe” effect that you get with your DeWalt. That would be annoying to me, especially in a dark environment, where the LED would be the most helpful. love the rack. must build one soon. Nice Pee-Wee impersonation with the scorpion! I liked how you put the supports together and installed on each vertical beam. It seems to be a great way to add more width for greater weight capabilities. My only question though…is there a reason why you only screwed in from the sides and not up from the bottom at an angle as well? Or would that have been overkill? No reason in particular, other then you have to stop driving screws in at some point. :) I just didn’t feel driving a screw up at an angle was going to make much difference. But I certainly have nothing against overkill. When you were laying the top sheet on the bin you said, “Be careful” and then laid the ply out by extending it with your arms, and thus you back. Way back when, I was shown to lift ply straight up, place the bottom edge on the surface, and then let the ply fall towards me by hand walking down and at the same time sliding it into place. I use this technique on the table saw any time I am going to extend by back. Please tell me that was a nintendo game system you used to prop up the hinge end of the swing-out sheet goods cart! lol no. it was a systainer from Festool. :) Almost as fun as a Nintendo. Is it possible that adding a shim to the lower hinge (on the wall side) would get the sheet goods cart to stay against the wall? I had a wood rack similar to yours, but had to disassemble during some renovations. I recently rearranged my basement and in the process I hung some shelf brackets on some exposed studs to use as a lumber rack. I did this as more of a time saver while I worked on other things, but I guess my question is, besides possible weight restrictions–is this a stupid way to go? I definitely wouldn’t say that’s a stupid way to go. Its just one way to do it. I would recommend going with beefier shelf supports though. While those will probably hold quite a bit of weight, its a good idea to get the heavy duty versions just to be safe. I worked at Home Depot, I wouldn’t use those dinky shelf brackets for much weight. There is a heavier duty bracket option at the depot, its white and has a cross member that connects the edges of the bracket (thicker metal too). This will dramatically increase the amount of weight you can put on it. This bracket should be very near the brackets you got. Even though you got the large sized brackets, I personally wouldn’t trust them to hold up too many pieces of lumber. Hope this helps! I saw your void in your MFT to turn yours into a router table. I was thinking about doing the same thing with my MFT. How do you like it? Did you modify your table top in the shop or is that something you purchased? It worked quite well when I didn’t have much space to work with. I like the sheet goods rack. I think I will build one for my shop. Thanks for the cool idea. For those with small shops, there is an opportunity to use the vertical space between the studs that are mounted to the wall. I store longer skinny scraps in that dead space. The scraps are accessible when the cart is swung out away from the wall. To prevent the scrap from falling forward when the cart is swung out, I installed screw eyes near the leading edge of the studs and use bungy cords. Well its wood and its supporting a lot of weight. I suppose sagging is always a possibility. But I won’t really know until a couple years go by. Of course I’ll be watching for signs of problems so I can address them before anything goes too far. I have been a fan of yours since your first video. First time posting a comment though. I like this project. I have a similar system going on in my shop, but with a fixed sheet good rack. I don?t have the available floor space for a swing out. If only I had a shop large enough for a swing out sheet goods rack! 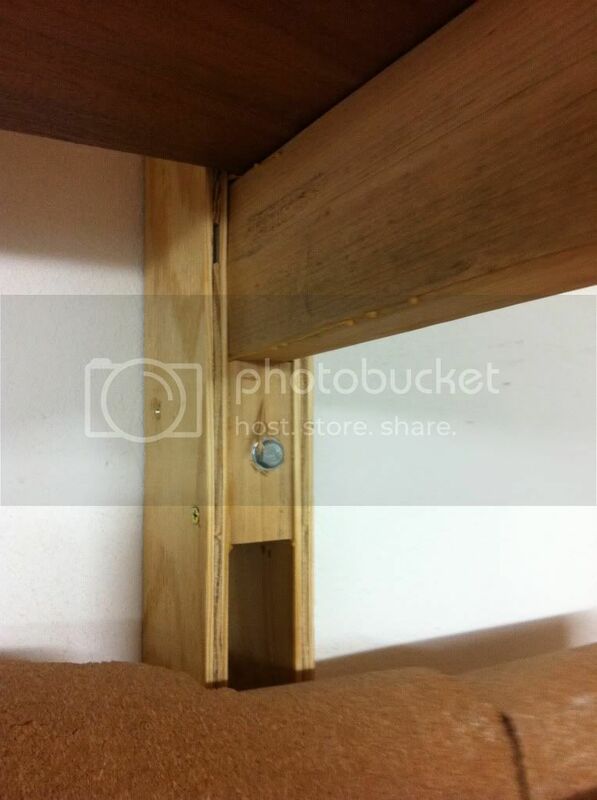 … Also, like Jeff said, that dead space between the studs is handy for storage of cut-offs etc. And since I have a low ceiling and concrete walls (basement garage/workshop) I have a pressure treated bottom plate on the floor with a header at the top and the studs are secured in between. I found it necessary to only adequately anchor it all to the ceiling at the header as the floor carries the weight and the resulting center of gravity holds it against the wall. Anyway, I couldn’t help but notice that while you beefed up the bottom for the caster screws to have extra wood for the screws to bite into, you did not do the same for the hinges, nor even mortise them. These will carry sheer weight as opposed to compressed weight at the casters. Hopefully this will not become an issue for you. Also, looking at the positioning of the sheet goods rack – it points towards the door. This looks like it would make it easy to load it from your truck with the trade off of making it less efficient to unload for shop use ? perhaps necessitating having to swing it out further to unload full sized sheet goods. (Hard to really get a perception of depth and available space from a video or pictures.) Do you think this will be a problem for you? Just asking. Great site. I really enjoy it. Hey Marc, looks great. My shop has concrete block walls, and I was wondering what your thoughts on attachment was? I’m going to go all the way to the ground to have the concrete pad support the vertical load, and I was thinking of taking 3″ L brackets and screwing those into the 2×4’s and then bolting those into the wall using concrete scews, approximately 4 per 2×4. Other than that, I really like the plans and it should work out great for my space. I think you’re on the right track AJ. I don’t work much with masonry so I am hesitant to make absolute recommendations in that area. But you are pretty much doing exactly what I would do if I were in that situation. You can now get (in the UK at least) screws that go straight into masonry (no rawlplugs!). I used them this very day to attach the 2×4’s. After attaching a test shelf I hung on it and it held my weight, so they definitely work! They are 7.5mm wide and you have to drill a 6mm hole and then drive them in with an impact driver or powerful drill (in one breezeblock the drill wasn’t powerful enough and I had to use the torx bit in a ratchet driver to get past the stiff spots and boy they were stiff and in there real good!). I had a wall that consisted of both breeze blocks and 9″ red bricks and it holds in both (although the breeze blocks seem to work a little better). I used the 120mm ones (5″) and had about 3″ going into the wall. which look the same sort of thing. Search for “masonry screws” and you’ll find them. Just finished watching the video for the third time. I have one bone to pick with you. You built the rack in the wrong shop! You were supposed to build it in MY shop not yours. Next time please get it right. I knew something was off when I built this thing. Darn it! I had a similar rack for sheet goods in my last shop, but haven’t gotten around to it yet in my current one. However one addition I has was a hunk of PVC tubing cut in half length-wise to make a slick bearing surface at the loading end of the sheet rack. It seemed (admittedly non scientific, certainly non-rigorous testing) to make it easier to slide the full sheets into the rack. At my dealer, they sell what would essentially be C or D grade plywood and that typically refers to the face quality. The stuff is no better looking on the face than the material from Lowes and Home Depot, but it is nearly always more stable. The material I picked up just happens to have 11 internal plies so you have to inquire about what cores they offer at your local shops. I can’t always get the 11-ply stuff. I used to even use a D-3 grade of birch ply that had a combination classic and mdf core. Love the stuff and it was only $40 a sheet. I actually made quite a few cabinets from the stuff and the faces were furniture-quality. I was always surprised that this material was graded at D-3. Ultimately, I suppose there will be some differences in terminology and materials from one place to another. But the stuff you see in the video is what I get when I ask for shop-grade ply as opposed to A1 cabinet grade. Great video. Quick question. What was the mindset behind not putting casters inboard, closer to the hinges? Seems like an inboard set of casters would dramatically lower the loading on the hinges. Just a thought. Yeah I think you’re right. Might not even be a bad idea to add a set in the center and keep the ones on the outside edge just for extra support. Is there any chance to have the SketchUp plan in Version 7 as well. Version 8 is not backward compatible and requires Intel based Macs. Thanks. You’re worse than the guys at the Apple store!! I was looking for a cable for my 3-year old iMac, and he suggested a new MacBook Pro instead of the older mini-dvi cable! I have a very similar design in my shop, and was scrounging looking for pics, but couldn’t find any. I put mine on all studs (16″) because I was going to load it up, but I DID do the 5-degree. Caution, guys – I found it was easy to slip on keeping the arms tight against the vertical supports. I have a couple that are barely slack, and I can see it in those arms now, having had it up for about 6 months. I have been traveling for work, so it was after having been gone and “visiting” home on a weekend that it stuck out. Now I have to find time on the weekends I’m home to fix it!! Well, I was about to go out to the garage (workshop) and start the sheetgoods rack when a storm suddenly swept in and attacked us. I lost almost half of the siding on the south-side of the house and quickly cut up my 4×8 3/4″ plywood to make a temporary floor in my attic so that I could cover the large air vent opening. It got sucked up in the wind along with the aluminum siding. Well, I guess it is back to Home Depot for my plywood Monday. Oh man so sorry to hear that John! I’m sure your hinges are more than beefy enough, but if you mount them on the other face of the stud (so that the hinge is opened up 180 degrees) then the hinge wont be trying to pull the screws out. This is how gate hinges are intended to be installed (something I found out on This Old House). Fixed casters are usually better in this application as the swivel gets in the way when you switch directions plus they usually cost less. You can also line the floor of the plywood rack with a thin strip of UHMW plastic which makes sliding the plywood in much easier. I just finished my sheet goods rack. I went with five casters and you are correct, the rigid casters would have been the better choice. Thanks Ed. Are you talking about the speed setting? it was on full blast if that’s the case. I’m not Marc, but I can tell you that the vacuum was on. The vacuum is powered on along with the saw. You may think that the dust collection is poor since there is some escaping directly from the cut but I can testify that this saw captures about 80-90% of the dust. You should see what shoots out the dust port with the hose removed. Duh, I realized I misread the question. Thanks for posting the answer Shotgunn since apparently I can’t read, lol. My shop has exposed studs. Is it necessary to add the upright 2×4, or can I attach the shelf supports directly to the studs? I think you should be able to attach directly to the studs. I agree with Sarit’s post, place a fixed wheel perpendicular to the rack’s long axis and it will move much easier (and never jam or wear out), and if you put another perpendicular at the other end you could use a cheap pair of hinges since they would no longer be load bearing. A scrap of formica countertop material cut into strips could be glued to the bottom of the cart to make sliding the long stuff easier. My only question is: Where the heck do you mount the flat screen man? A really great lumber storage solution, Marc, but I’m curious why you didn’t somehow incorporate the vertical sheet-goods ‘3 veneer press screw’ design you had in your old shop to keep the plywood from bowing/warping etc. Primary because I didn’t notice it doing much. It wasn’t as effective as I had hoped. I don’t think this will fit in my shop, but I plan on looking into the video again, because I think there is always something to learn. How do I get my picture next to my name??? Then just make sure when you leave a comment here, you use the same email address. That really is a great setup! I don’t have that much room in the garage, and I don’t think I have the room for the cart portion, but I may have to give the rack portion a go for my lumber storage. I really like this lumber storage. I need to build me one some day. Sorry if this is a little off-topic. I notice that when you use the festool track and plunge saw, you seem to lay the ply directly on the table. Are you putting a kerf in the table, or am I missing the spacer pieces underneath? Yes, the piece is cutting a kerf in the table. That’s actually very intentional. The top of an MFT is sacrificial. You don’t want to cut any deeper than you need to, but the MDF provides a nice zero clearance for each cut. Cool Racking System going to make one of these for my garage. the one I have at present isn’t really working as I have everything vicky-virky. Well I am using this plan as inspiration for my own build of the lumber rack (that I am quickly trying to finish so I can get on with the Adirondack summer guild build). My garage is in middle of re-arrangement to get access to the wall to do this (used to be where lawn/garden equipment and boxes of wife’s ex-husband and her stuff had been stored when we first moved into house – I finally got two of them to sort it and get rid of it and haul his boxes out of garage. Anyway the ledger board and verticals are all up and all the arm pieces are cut except for the tapers on the plywood arm brackets. I came up with a good idea to make a quick taper jig from one arm bracket by leaving a portion behind to form a hook and then I can cut that hook off once all the other tapers are cut. Doing this because I have to unbury the band saw to get at it if I were to cut these the way Marc did and the table saw is out and available and I can cut the jig quickly using the handheld jig saw. Can’t wait to finish this and put my shop back together and get the lumber up off the floor. My only modifications are dealing with the shorter ceiling so making the lumber rack take up a whole 22′ wall with the plywood bin at one end (to be built latter – don’t have but two half sheets to store right now). and the other end will have my radial arm saw bench (inherited the radial arm saw otherwise I would probably own a miter saw). The other modification I plan to make is to use some of the left over 2×4’s to make a 3 1/2″ ledge on top of the ledger board (the horizontal board) and cut two 6″ x 8′ plywood strips to run along the vertical support (horizontally) behind the plywood storage bin to allow for a bit extra storage of cutoffs between the vertical studs behind the plywood storage bin. I should have this all done just in time to go buy my lumber for the guild build by mid-week and have a place to put the rough lumber as well as the stack of lumber already in my garage. I have returned and watched this a few times – the simplicity is what works better than anything else – i expect to have completed with just a few alterations. Mainly i am going to set up the front side so I can (with Festool Plunge) do some tracksaw action and breakdown on the actual rack prior to milling to final on TS as needed. Otherwise – a WHOLE lot like this one – thanks Marc. I just built your lumber cart in my garage shop. I used a fixed wheel, not a swivel, but other than that I did it the same way. I worked out great, awesome solution. Thanks! Good solution for a wall rack. I work from a single-car garage. So I don’t have spare wall space. All my machines have to go against the walls! I use a ‘rafter-rack’, just high enough so my up and over door can open and close without fouling! With your horizontal supports though, I might have notched them into the upright supports for extra strength., Although maybe I am just a ‘Victorian over-engineered’ kind of guy! Just what I need for my shop. I love the pull-out lumber rack for the sheet goods, I think it works better then when you were first in the same shop space. Regarding “Racking my Brain” One word “Awesome” I’m very impressed. Just joined this forum, and have been pleasantly pleased that my expectations were more than satisfied. In watching the podcast, I had a couple suggestions that have already been addressed by others, but if I can offer just a small tweak may I suggest, when cutting out the support outer pieces that attach to the vertical 2×4’s. I noticed that you cut each one separately. I would have cut two parallel cuts, then made the angle cut between the two ends. Then you would cut off the flat part represented by the area that goes on the 2×4 if you wanted to, otherwise you could just leave that part and have a larger area to nail into. scrap you throw away is a little less, but the biggy is you only have to make one diagonal cut for each support instead of two. I’m a penny pincher and like to save every inch of wood possible, but like I said, making one diagonal cut instead of two, saves you half of time required to cut two, If I didn’t make myself clear, let me know and I can send you a sketch if you would like. I have already seen many of your videos and am I ever so glad that I made the effort to join. I see that my shop is all wrong and I’m going to be making some changes, thanks to you. Again, Awesome site. I’m about at the age to retire and If I had found this site earlier, I might would have already been there. Great video, I’ll be building one of these soon in my garage… but that’ll mean I’m officially hooked on wood working and I’ll have to permanently eject one of my cars from the garage. I think the Honda needs to get more fresh air anyway. Now that you have been using the plywood storage for awhile can you tell us how it is working for you. I often find that after a few months working with a jig or something like your pivoting rack that the project will show me an area that needs improved. I am curious as to how well it pivots when fully loaded and carrying a lot of weight. To be honest Joe, I haven’t used it much. I spent the entire summer working on my Adirondack chair and I am now finishing up some shop projects. Now that the shop projects are winding down, I’ll have to put some of the excess plywood away and that will be when I have to move the rack again. But so far the only issue is that I’m lazy and I tend to lean things up against the rack instead of putting things IN the rack, lol. I was going to build this, but ended up getting over 80 feet of 2×4 steel tubing 3/16in think for 10 cents a pound(only $70). (cheaper than the wood it would cost to build it). I figure if I build this out of steel, it will last forever, and will be the last I’ll ever have to build. My only thoughts are whether you like the hinge idea, or do you think it would work equally well with it being on 4 castor wheels instead? I like the idea of moving it to other areas of my shop when stacking wood(from the trailer etc.) What are your thoughts? Personally I like the hinge. I really have no need to move it around. Also, when pushing in a big sheet of ply, it’s nice to have one side completely secured. I just finished building the lumber rack portion of this video. I’m worried about how much weight this thing will hold. I used the same plans as Marc used with one small change — my shelves are only sixteen inches instead of his 21 (or whatever it was). Otherwise, i followed the plan, using the same screws and also added lag bolts. I started loading up the wood and was getting scared about how much I was putting up there. I never even put all I had. I don’t really have a sense of how much the wood weighs, but I’m guessing there’s at least 250 pounds up there (the top shelf is nearly all hard maple). Can anybody calm my fears? Well, I’m not sure I can calm your fears but I can say I have at least that much weight on mine and all is well. No sagging or evidence of problems yet. Do you actually see any visible evidence that something is wrong? No evidence that something’s wrong. I just wonder about how much weight it can comfortably hold. So far, so good. I even added more up there. Those shelf brackets are good for at least a 100 pounds. And with 6 of them and 2 levels, You could put 1200 pounds up there. You would have a hard time fitting enough wood up there to stress the shelves. I made mine out of 2×2’s, but only 12″ long and using 1/4″ plywood. I can hang off of any of the spokes (~180 lbs). You’re fine as you’ve spread the weight across many units, and if you used 3/4″ plywood like in the video, You’d pull the stud out before you lost the shelf. Thanks for the design Mark! My attempt at building this rack came out great. Very efficient use of space. You are missing a knock out in your electrical box. You might want to fix that real soon be. Other then that.. I love your lumber storage rack! I already built my lumber rack using a slightly different design, but more or less the same. Yours is better, however. Also, I have to echo what someone above said; Is it abnormal to be this excited about a plywood cart? It’s an amazing design, and I can’t wait to build today. I, too, make use of the shop grade plywood for many projects. I primarily build custom frames for upholstered furniture, so the rigidity of that plywood vs yellow pine is perfect for what I do without the added cost of oak ply, which is totally unnecessary. I do, however, occasionally buy blondewood plywood at Lowes for these projects. Its about the same price as my local hardwood dealers shop grade ply and it never warps on me even after sitting for a few weeks. Again, thanks so much for the plans and the perfect design. Can’t wait to get that sucker into commission. Marc, et al – Question – you mention you like to make the vertical supports one piece. The plan I followed a couple years ago had multiple pieces joined by plywood on the outside. The pieces were separated by 3 1/2″ (2×4) to create a mortise that you slide the lumber rack arm into. It was supposed to fit tight, but kept it level by the strength of the mortise. I’m getting ready to move mine, and I see that a couple arms’ mortise wasn’t quite tight enough to hold the arm perfectly. I’m looking to compare the strength of the two designs. Do you have any thoughts? I think I need to see a picture to fully understand your description. Do you have a link handy? I see now. Hard for me to say which would ultimately stronger. I can say when i disassembled my rack for the move, I was pleasantly surprised to see no visible evidence of sagging or damage. So I am pretty confident in the design shown here. Thanks for the excellent design. I will be constructing one of these (with slight modifications, of course) for my brand new shop. Have you looked into the weight-carrying capability of the cantilevered arms? I made a similar rack years ago and had over 100 bd. ft. on each level. This one should do as well or better. Well if by “looked into” you mean put lots of wood on them, I sure have. :) I just disassembled the unit for the shop move and there were no signs of wear or sagging at all. So I’m pretty confident in the design at this point. I used your basic design, but with a slight modification in size. My plywood sides were cut 15 7/8 x 6 and the 2x4s were cut 15 7/8. That allowed me to get 48 pieces of plywood from one sheet and 24 pieces from 4 2x4x96. That’s 24 shelf brackets with practically no waste. The 2×4 extends past the end of the plywood by 3 1/2 inches. ok Marc, I uploaded somewhere else… Maybe you can see these. Very cool Love the modifications and the reason for it! :) Enjoy that stash! All that lumber was salvaged from trees removed from this property to build our house. Do you see any problems doing this? Seems like it would be OK to me, but I’m no structural engineer. Hmm, I have a question. I am currently replicating some form of this in my shop and I am making some modifications. I am unclear why you ran the 2×4’s down behind the sheet goods rack? with mine I am mounting it to the wall so it will be able to move in almost flus with the wall. I have a smaller shop, floorspace is precious. So is there a reason you ran the 2×4’s all the way down instead of putting the bracer board above the sheet goods rack? In my case, the concrete footer juts out a few inches. Additionally, I needed something sturdy on which to attach my hinges. So it just made sense for me to continue the 2×4’s all the way down. If your situation doesn’t require that, you can certainly re-gain a few inches of space by stopping them just above the sheetgoods cart. Ahh, thanks. I was wondering if I was missing something structurally that would make it a bad idea. Perhaps a little. But the lag bolts should take most of that away. I wouldn’t expect them to be absolutely rigid, but there should be securely locked into the wall. I am just finishing a new workshop/ garage (43′ x 24 with the shop taking 24′ x 24′). I am going to finish/expand my rack this weekend and build the sheet goods/shorts cart. I had a much smaller version (2 verticals and 2 shelves) at my other house and now I will be adding another vertical member and 3 shelf supports. Is the 30″ high (plus the caster height) sheet goods cart necessary though? I imagine I could go with a 25″ high cart (plus the caster height) and save in material cost without losing any support other than how much the sheet goods lean. Was there a specific reason for the 30″ cart in terms of plywood warping? Not really. Just sounded like a good number to me. :) I think you’ll be fine with your measurements. I Love your Podcasts! I want to build such a rack myself. Could I also use OSB instead of plywood? Probably. It isn’t my favorite material to work with though. And I can’t really comment on any strength issues it may present. I just don’t work with the stuff very often. When are you supposed to let your boards dry, before use – and when are you supposed to use them before they dry & warp? Now I think I’m the one who’s confused. :) Your boards should probably be dry before you even get them, either air or kiln dried. Once in your shop, you can let them acclimate for a few weeks before using them, but that isn’t always necessary. Nice design. My modification is to separate the sheet goods rack and put it on 4 casters. This allows me to accomodate more hardwood in the wall rack, which has levels right down to the floor (actually 6″ above the floor). I get rough hardwood by the 100 ft. lots, so I need the storage. When it is finished I will send a photo of the rack with some wood on it. By the way, I am using counterbored 6″ lag screws to attach the 2 x 4 verticals to the wall studs. Also I have a bunch of 1/2″ ply from another project and I am making the support arms with that ply instead of getting some more 3/4″ ply. Given the design of the arms, I can’t imagine overstressing a couple 1/2″ pieces. That is a full inch of plywood on its edge which is 6″ wide. Should be able to support a passing locomotive. Also I used 2 1/2″ deck screws to put the arms together and 3″ x 1/4″ carriage bolts to hold the arms to the verticals. Would you recommend a 5/16 or a 3/8 for the Lag Screws. I will be building this system with the cart in the next couple of weeks and need to order hardware ahead of time. HD too expensive. I have not watched the Video so if it is mentioned on there then my apologies. I think either size would work. I noted w interest Jeff Wenzel’s idea of using the space between wall studs. My thought would be to extend this concept with bars or plywood plates sticking out into the room from the wall studs to make deeper “bins”. Perhaps as much as 2 or even 3 ft deep. The bars or plates could have holes along their length to make the bin size adjustable by simply moving the bungie cord location. Without the benefit of other expertise and advice, the only concerns I can anticipate relate to the studs and sheets taking a bend set over time, and the stability of vertical stacking. If all the stock is stood straight up as opposed to leaning in the bins, both concerns are reduced. I would also think that permanently attaching the rack to the walls instead of putting the rack on rollers would eliminate the stability concern. I actually have my sheetgoods rack vertical in the new shop. I think it may just come down to personal preference. But if you can get it set up vertically and you don’t mind working with the material that way, I can’t see anything wrong with it at all. Nobody seems to think that warping is an issue with wood standing on end, and I am pretty convinced that this is the most space efficient way to store a larger quantity of lumber. So I think I will make a full 4×8 rolling rack which should be big enough to be stable. I’ll probably make 2 slots 1 ft wide by 4 ft deep for plywood and paneling standing on end, and 2 slots 2 ft wide x 4 ft deep – one for 2x4s on end and one for wider planks and boards on end. Then I’ll make one 2×2 bin and two 1 x 2 bins for assorted other lumber and hardwood on one end and some smaller 4 ft wide horizontal shelves at the other end for stacking smaller pieces per AJ’s suggestion above. Since my rolling cart can be moved, perhaps I can integrate a panel cutting station on the rear. It might be wise to make the back wall and dividers about 6 ft high to support the standing lumber or perhaps add some adjustable jambs within a 4 ft high cart – in both cases to ensure that everything stands perfectly vertical and thereby stop the lumber from taking a bend and more importantly to keep the whole thing from falling over if the contained lumber leans too much. The alternative would be a 3 x 8 Fixed Rack against the wall with no panel cutting station. Frankly, I think that a 4 x 8 area of wood standing on end is a LOT of lumber. I have this image in my head of a 6 ft diameter section of a tree trunk that is 8 ft high standing in the corner of my shop. Obviously, the wheels and rack structure required to support that huge tree trunk will have to be VERY substantial. Since one can never have too much lumber, it will probably be wise to start looking now for the materials needed to make an outside lean-to for storing more stock. The nice thing about horizontal is that you can stack smaller cutoffs. I’m thinking about useing this basic design but modifying it to attach to the angle of a cathadril ceiling. I’m in a small 17 x 11 shop and I’ve already devoted the walls to tool storage, but I think that ceiling might lend itself well to lumber storage. Any ideas on how the plans should be modified to handle the angle? I have been considering and designing a lot of different systems for my shop/garage and I think I am going to go with your design. One question I have is; since your sheet bin does not allow for shelving to be in its height area why do you run the verticals all the way down (other than to attach the bin hinges to) ? Why did you not run your ledger board higher and just run the right vertical all the way for the hinge attachment? Honestly, this was just a quick and dirty design. You have probably already given it more thought that I did. So I have no doubt you might be able to identify some simple structural or functional improvements. I want to know what is the most weight, or board feet of, let’s say oak that you have put on a shelf. I have eight boards of oak that I inherited that are 13″ x 2″ x 13′. They are approx 80 lbs. each. I think that they would be too much for this design unless you have done the same or more I don’t want to try it. Hey Richard. I honestly don’t know the answer to your question. I put quite a few boards on my rack and it held up quite well with no sagging. I’m sure the unit has a weight limit but I have no idea what that is. But when the weight is distributed over numerous arms, you’d be surprised at how much a design like this can handle. But for safety and liability reasons, I can’t give you any solid guarantees. I like the desinge and looks of your rack. Do you have a Materials List for this project? Also what is a Sketch Up file and why would you want one? The thing with storage is that is hard to find space for it, this is a great option. Also, thank you for putting a PDF version of the plan for us Sketchup challenged individuals. My wife and I really appreciate your videos…thanks for sharing the knowledge. Now that you’re in your new shop, did you move this lumber rack to it or did you do something else? If you did something else, what did you do? I actually left the lumber rack in place for the new owner. In my current shop, I decided to go with some metal garage shelving. It’s the closetmade stuff rated as Heavy Duty, from Lowes. The parts can be pricey, but I already had a bunch of the stuff laying around from general garage storage and decided to recycle it for the lumber rack. Just thought I’d add my 2 cents to the guys asking about running the 2x4s only down to just above the sheet good rack… I would recommend running them floor to ceiling much much stronger! I just built this today. Thank you so much for all of your videos and instructions. My cart rolls out from the wall too but I just installed a braking caster as one of the wheels – no more rolling and is very secure. Thank you for taking the time to post these videos and projects. You have taught me a lot. As a side not I have only concrete block walls in my garage so I just used tapcon’s and I am pretty sure I could hang my truck off this thing. Hey Marc — I’m not sure if anyone else has run into this, but there’s a dimension error on the PDF version of the plans (the IdeaRoom and Sketchup plans don’t appear to have a problem). On Page 4 of the PDF plans, you have an offset of 26-3/4″ from the right edge of the Plywood Rack – Middle piece to the edge of the 5-1/4″ divider. That should read 26″. Unfortunately for me, I elected to use the PDF plans when I started to build this last weekend. This really through me for a loop as this is my first major woodworking project (I’ve spent the past several months watching your videos and building my tool collection based on many of your recommendations). What really blew my mind was at first glance, all the dimensions seem to add up. After staring at the picture long enough, I realized that the 3/4″ width of the 6″ divider wasn’t taken into account on the drawing. I’ve already glued & fastened the dividers in place. I’m hoping that I can weaken the Titebond glue enough with a heat gun to remove the dividers and place where they belong. If that doesn’t work, I’d appreciate any ideas that might help me get back on track. Thanks! It actually looks right to me. I don’t see why the measurement needs to be 26″ instead of 26 3/4″. From what I see, the PDF and the SketchUp plans match up. Can you clarify on why you think the 26 3/4″ is an error? I’m about to build this lumber rack in my shop, but in my shop, it is a post and beam with the posts at 7’6″ apart with horizontal strapping. Then, the interior is 3/4″ plywood. Do you think the 3/4″ plywood walls is strong enough to hold this? Or should I add some additional strapping like a 2″x”4″ flat against the wall then center the project 2″x 4″ in that? Just wondering what your thoughts are, or if anyone else wants to give a comment on this. I’m currently converting my detached 1 car garage (10’x20′) into a woodworking shop. Time to move out of the basement! I’ve been looking for a lumber storage system as my garage is too small for the amount of joist hangers required to store my large supply of lumber. Many were ridiculously over or under done. Yours is just right. And the sheet goods box is great add-on! Thanks for the great plan and video! Just found this design and will be using it in my shop area. Enjoyed reading all the comments and suggestions. I will add a 3/4″ x 2″ wide plywood horizontal strip to the support studs before securing the arms. This horizontal strip can be leveled and secured to the support studs before the arms are attached which will ensure that the arms are level and have additional support. I realize that I will be losing a bit of storage space but the 3/4″ x 2″ strip will take up very little of the storage space. Would like to hear from others about the moveable cart with regards to how the attached hinged end and the casters are holding up???? Any suggestions on size of the hinges and casters??? Very good use of space and materials. I’m at the stage of drywall and paint so rack is next. Has anyone tried this on a block wall? I just built this rack. Mine goes up to 12′ with 6 levels and is 12′ wide. The top shelf is reserved for the very light material like trim and such. The only change I would make to this is to use 6″ Spax lag screws for all connections to the walls. You would avoid the counter sinking and make more solid connections throughout. I don’t think it is going anywhere though. I’ve loaded this thing pretty heavily. I feel confident that the rack will hold. I just hope the wall does not fall down. I did not make the plywood and small pieces cart. I never keep plywood on hand. I buy it and cut it. I have pics if there is a place for those. Thanks for the design, and inspiration. I’ve needed to do some Spring cleaning for about three years now, and finally did it this year. 1. What kind of screws were used for the cart construction? I’m assuming they are more than drywall screws? And can they be bought in bulk? 2. Has anyone made the plywood cart free-standing & if so, how did you make sure it wouldn’t topple since 13.5″ isn’t very wide. Thanks for the plans & the insights! I use basic square drive wood screws from McFeely’s. McFeely’s has bulk pricing. Ah, I knew there must have been something better than drywall or deck screws! I like the lumber rack. I think that same design would work well for vertical lumber storage as well. Just attaching a toe kick board to the floor would allow for easy vertical storage. In that case, one could simply put the sheet good cart on four casters, and roll it against a wall. Nice design, and thanks for the video. No. But I know lots of folks who have (and clearly prefer) vertical racks. Sounds like that might be the best option for you as well Ron. I always enjoy your videos. I have a steel metal building, so no ‘studs.’ Have you ever built a lumber cart that has all four casters and can be moved around the shop? I’m also in AZ, what lumber yard did you use for your sheet goods. Never built anything like that Dave, sorry. And I get most of my sheetgoods from Spellman Hardwoods in Phoenix. I have just recently found your videos on youtube, and this is the first time on your website. All I can say is WOW!! I really appreciate all of the work you put into this. I am just beginning my woodworking hobby so to speak. I grew up helping my dad and grandpa do wood working, so I do have a background, but haven’t done much on my own. Just a few smaller projects around the house. I am really inspired by your videos, and plan on using your plans to build some of these projects to beef up my garage into a full on woodworking shop. My first few projects are going to be the lumber rack, table saw outfeed table (which I’m going to turn into a multi use mobile table for assembly), and I will install the French Cleat system. These are all great projects. Thank you for the inspiration. I look forward to learning more from you. I have been watching your videos and reading your blog for some time. I enjoyed this project because it was a hybrid idea from others and your own ideas/needs. Which, inspired me to make my own version. It was more intense and i had to adjust fire several times to make it work in my garage workshop. Thank you for this video and plans. I really like your plan. I would like to build it in a steel storage container (Conex Box.) how would you attach it to the inside walls or could it be free standing? Thanks, Gary. Is there a reason for angled cuts in the plywood sides of the shelves, other than storage height? I’m about to start on your lumber rack. I’m sure you have had lots of feed back on your design. Is their anything you would change or do different or add to your design. Thank you for your time and as we say in the fire service stay safe. Nope. It’s a pretty straightforward design and any changes you make would just be due to personal preference and material availability. This is a great video. I’m a new woodworker and I’m finding out that lumber becomes a HUGE issue when storage is involved. Im Interested in using lag bolts, but I’ve never actually used them. Is there a proper way to install lag bolts? Can you explain the drilling method and perhaps the size of bolts needed/washers needed. Sorry for such a noob question, but I wanted to hit the ground running on this project with as few hiccups as possible. Thanks in advance! I want to make your swivel plywood rack, but I’m concerned on the back sheet and what gives it support of leaning 4’x8′ heavy sheets of plywood. Seems there are only screws running along the bottom and the swivel edge. Am I missing part of the plan? Wondering if several sheets leaning on the back will be able to support the weight? Hey Randy. Glad you found us! What you see is what you get on this one. There’s really only so much you can do if you’re goal is to have a full 4×8 clearance for a sheet of ply. So screws along the bottom and back are about the best you can do. One alternative option if you’re concerned about the long-term viability is to make that back piece taller. Make the entire thing a little taller, in fact. Then you can run some cross-pieces over the top connecting the front compartment to the full-sheet compartment, giving it a LOT more stability. But in order to make the whole thing taller, you’ll either have to add on to the plywood back, edge to edge, or maybe break the back panel up into a couple pieces where the grain runs vertically, giving you the option to go taller than that 4′ mark. Marc – my small basement shop had lumber everywhere. The wood storage rack is a perfect solution. Thank you very much. Bill.